Published: Dec. 30, 2012 at 08:23 p.m. Updated: Dec. 31, 2012 at 10:12 a.m.
Andy Reid is officially out in Philadelphia, a place where he seemed to never be truly embraced. Yes, his clock management wasn't the best, but hopefully fans in Arizona, San Diego or any other possible landing spot will be able to sacrifice a few burned timeouts in exchange for consistent playoff runs and a run to the conference championship game. Reid is likely one of the most beleaguered successful coaches in NFL history. Yes, the Eagles did fall short in a number of NFC title games and one Super Bowl. But that kind of success would canonize you in Cleveland. 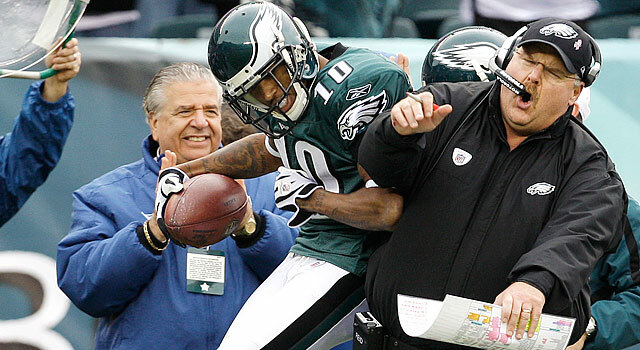 Well, he was embraced by DeSean Jackson in the video to your right. But it's cool, Eagles fans. You want to win the big one that has avoided you since Chuck Bednarik played both ways. Fair enough. But let's take one final look at the six greatest moments in Reid's Eagles career before you move on to Jack Del Rio. The Eagles trailed the Packers late in a 2003 NFC divisional playoff game. Faced with a fouth-and-26, quarterback Donovan McNabb scrambled and found Mitchell, who beat the Packers defense for a first down. McNabb then drove the Eagles into field goal range, where David Akers tied the game and eventually sent it to overtime (where the Eagles won). Sure, McNabb might not know the overtime rules (which seems like an epidemic among NFL players and even a majority of the analyst who cover the sport), but he still delivered 92 wins for the Eagles. And yes, he wasn't what you would call clutch. But consider most fans wanted Ricky Williams (you did, don't deny it), and the two quarterbacks sandwiched between McNabb were Tim Couch and Akili Smith. You could have done worse. This is also known as the Miracle at the New Meadowlands, but the Eagles capped an amazing rally over the hated Giants when DeSean Jackson returned a punt for a touchdown to give Philly the win, 38-31. The Eagles had fallen behind by 21 points with 7:28 left in the fourth quarter, but scored 28 unanswered points (capped by Jackson's walk-off punt return) to win the game. The Eagles entered Week 17 in need of a lot of help. I mean, they needed the hapless Raiders to win on the road at Tampa Bay. When Oakland pulled off the improbable upset, the Eagles only needed to beat the Cowboys at home to reach the playoffs. And that's exactly what happened. The Eagles embarrassed the Cowboys, 44-6, to make the postseason. The Eagles went all the way to the NFC Championship Game, and were it not for a slow start in that game, would have won their second NFC Championship under Reid. The Eagles opened the 2000 season in the scorching heat of Texas Stadium (well over 100 degrees). The Eagles showed some gumption when they opened the game with an onsides kick and followed it up with McNabb's touchdown pass to Jeff Thomason. The Eagles would jump out to a 21-0 lead, and went on to win the game, 41-14. And everybody credited pickle juice for being able to avoid cramps and dehydration. Seriously, pickle juice. The Eagles notched their second Super Bowl appearance in franchise history after they dispatched the Vikings and Falcons to reach Super Bowl XXXIX. Sure, the ultimate NFL experience is to win the Super Bowl. But again, nine playoff appearances, five NFC Championship Games and a NFC title isn't anything to quickly dismiss. Or have we forgotten Rich Kotite? "Black Monday: Six coaches fired too soon..."